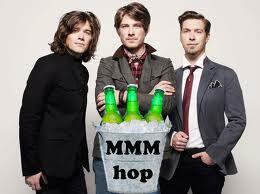 As kids, they gave the world “MMMbop.” Now, as adults, Hanson is releasing MMMhop out into the world. The brothers of the boy band-turned-fully grown rock trio announced at a talk at Oxford on Monday that they will be entering the adult beverage market with their very own brew. While it’s a cute name, the idea shouldn’t actually come as a surprise. The band runs its own independent music label, self-releasing its albums, and has a whole line of branded products that their still-rabid fan base love to buy in bulk. Isaac Hanson, the guitarist and oldest of the trio, is 31, while middle brother Taylor, the keyboard player, is 28. They each have a number of children; Taylor has 4, Isaac has 2, and Zac has 2. They’ve released eight studio albums.